I decided to write this down for multiple reasons, but mainly because I have spent a bit of time to dig through this and get started. If you're working on a different module - you probably want to read, but do a bit more research yourself. 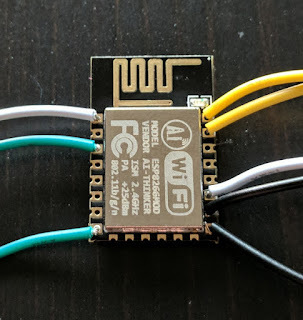 The above is the ESP8266 12E module i've been trying to get to work for past few days. The module itself comes with a flashed image that works sort of like an old AT modem. Once it boots up, it will start talking over UART (top left two yellow cables on the image) at 115200bps, 8n1. You can use this default image to do the basic programming with arduino etc, but - let's face it: this module is fine working all by itself, and having an arduino controlling it is in most cases pointless; there are GPIO pins available on this baby, there is I2C interface, it draws very little power etc etc. This tool requires 3.3V supply and if you supply 5V well it might work for a while, but no promises. I used 5V with mine for a while and it still works, but I suspect only because i never got it running at this higher voltage for too long. RXD, TXD - to TXD and RXD of your UART endpoint. Finally, there's GPIO0 (~FLASH), which is used to either boot flash bootrom (GND) or user code (VCC). You will likely want to have a look at datasheet; table 4 is particularly useful. First and foremost: the bootrom of this baby talks at 74880bps. Yes, you read this right: 74880bps. Most of the tools I tried failed to set the /dev/ttyS0 to this, well, unusual speed. All except for miniterm.py command, that was delivered with python-serial (or pyserial) debian package. This tool is capable of talking 74880bps even on Rasberry Pi, so it's quite good. Why is this important? Well, each time you need to reflash your card or diagnose a (likely) reboot cycle, you need to be able to switch your serial port to 74880bps. It comes with everything you would need to get started. There's even a 'blinky' example code that you will want to deploy to your ESP8266. It shows how to write and compile C code for that unit. Installation takes about 90 minutes on Raspberry Pi. The installer there builds compiler, libraries and tools, and, well, it takes time, but it's worth it. If you haven't already, go get it. Once you have the toolchain (compiler, linker, ...) available, let's try to build and deploy blinker. It sounds like it's a simple job, but it isn't necessarily. Inside the esp-open-sdk folder there's 'examples/blinky' project that builds and installs with makefile. it is for that exact reason, that your init data file cannot be found by the boot rom. This question explains it in greater detail. Done? Connect GPIO0 to GND and execute: make clean && make flash. Finally, connect the GPIO0 to VCC and power-cycle your unit. The led should start blinking. I hit that after adding maybe 5LOC that were essentially debug prints. Soon after I read I may need to add a compiler flag: -DICACHE_FLASH to get past this error. When the above works, you will see your unit talk at 115200 over serial port again, and serving your AT commands. More details about this are on NodeMCU website. You may be tempted to write C++ code now that there's a C++ compiler bundled in, too. It's not going to be simple: the SDK does not include most of the library calls. These calls exist, of course, and can be easily linked by the C compiler, but C++ emits and looks up a bit different symbols and needs to know what it's after. This will all certainly be possible once we have the proper header files - or, if you want, you can create one yourself. Sadly, this means creating an extern for every single call that you want to use. The API Reference for ESP8266 is here.